Philosophers David Chalmers, Galen Strawson, and Philip Goff, among others, have defended versions of panpsychism, the idea that consciousness is a basic property of our universe, like forces and matter (bosons and fermions). Some scientists, including Adam Frank, a Professor of astrophysics at the University of Rochester in New York, and Marcelo Gleiser, a theoretical physicist at Dartmouth College in New Hampshire, have aligned themselves with these philosophers. They are the sophisticated authors of this recent article in Aeon magazine The Blind Spot who, along with the third author philosopher Evan Thompson, work at The Institute for Cross-Disciplinary Engagement at Dartmouth which is an “Aeon partner” that “receives generous funding from the John Templeton Foundation.” The John Templeton Foundation gives out millions of dollars each year and one of their priorities is funding, and thereby promoting, arguments for theism by professors within otherwise secular academic institutions. Panpsychism is not theism, but it can be construed as being consistent with theism in the sense of god being the conscious foundational precursor and basis for everything else. We can logically derive mechanical action, such as walking and talking, from the activity of neurons based on energy and matter alone. Panpsychism deems energy and matter alone to be insufficient to explain the self-perceptions of color, of sound, etc., the feelings of hunger, pain, etc., and the ability to be consciously self-aware. We not only have no explanation for our ability to experience our own perceptions, feelings, and self identity, we also currently have no clear ideas how it could be possible to have experiences like these. Therefore, advocates for panpsychism conclude consciousness needs to be added to the lowest level description of our universe as another of its most basic components. But is it really true that consciousness is impossible within the constraints imposed by the existing core theories of physics? There are many examples where emergence has more tricks up its sleeves than our simple and limited imaginations allow for. There are multiple theories/languages/vocabularies/ontologies that we appropriately use to describe the world at different levels of coarse-graining and precision. We now have explanations for phenomena that not only were previously unexplained, but that we also previously lacked even an ability to attempt to explain within the constraints of the information we previously had to work with. For example thermodynamics (fluids, energy, pressure, entropy) resides at a higher level relative to the lower level kinetic theory (collections of atoms and molecules with individual positions and momenta). There are two ways of communicating how our universe functions here, each entirely valid within a domain of applicability, with the domain of one theory (thermodynamics) living strictly inside the domain of the other (kinetic theory). Crucially, the emergent higher-level theory exhibits features that are absent from the lower-level theory. Thermodynamics has an arrow of time defined by the Second Law (entropy increases in isolated systems), whereas the microscopic rules of the lower-level theory are completely time-symmetric. Directional time appears as an emergent macro level property of our universe that (to the best of our current knowledge) has no presence at the lower micro level. There is no doubt that our future understandings of how the universe functions will continue to transcend our past imaginations of what is possible. Meanwhile, while our limited imagination fails us, while there is still no path to explaining what we observe from our current state of knowledge, it can be tempting to assign a property from a higher level description of our universe to the lowest level, basic building blocks description of our universe. This approach intuitively appears to provide us a sensible and reasonable path to explain the sudden appearance of an otherwise unexplained emergent macro level property. But human history does not support this intuitive approach for determining how the universe operates to be useful. We should not take such shortcuts to try to bypass the need for anchoring our conclusions in empirical evidence. We have no empirical evidence for the presence of consciousness anywhere outside the context of biology, let alone at the lowest level description of how our universe functions. Higher level phenomena often exhibit new features not found at the lower level from which they emerge and sometimes these new features are unexpected and difficult for us to account for. Accordingly, the best fit with the available empirical evidence is that consciousness and related phenomena are still mysterious macro levels emergent properties from within biological contexts. Therefore this conclusion is more likely to be true than Templeton Foundation promoted speculations like panpsychism which are built on the human discomfort with unresolved mystery. We may continue to encounter formidable obstacles to solving this particular mystery. We do not know when we will obtain an answer. There are no guarantees that we can solve all such mysteries, including this one. An expectation that we can, and will, fully understand all phenomena of our universe, even given much more time, is itself not well justified. We lack full access to all information. Humanity is arguably like a blind person trying to describe an elephant by examining only its front side. Nevertheless, we have been remarkable successful and the slow, arduous, imperfect, and error prone effort required to obtain and follow the empirical evidence is by far more productive than idle imaginary speculations and superstitions. The Templeton Foundation money is not being well spent. It is most likely that the evolution of humanity was complicated and messy, it was a many generation, many century, many locations, gradual process. Trying to fit that into an Adam and Eve scenario sounds more like sophistry than reason. Some Catholics in particular cite Thomas Aquinas for his philosophical, sometimes non—literalist approach, but they conveniently overlook that he believed in a literal seven day = 168 hours creation, a literal Adam, and a literal Eve. Christianity is big and diverse, and at St. Edward University we find a positive example of a deeper commitment to the students and society from within a Catholic institution. Professor Mitchell teaches a course Perspectives of Atheism. This is not a course where students are introduced to arguments for why we should be atheists. Instead, A.C. Greyling’s book “Meditations from the Humanist: Ethics for a Secular Age” is assigned to the students. Given the tendency for too many religions to negatively promote fear of atheism (for example, the Vatican equates atheism with Hell) instead of positively promoting understanding, it is noteworthy that every now and then some institutions with religious affiliations are better than that. We should not underestimate how significant and positive it is that we sometimes have a willingness like this to reach across differences of belief. To be flexible this way can also be good for religiously affiliated institutions that want to attract and retain religion skeptical and non-believing current and future customers. It appears that Justice Breyer may want to avoid a decision that the Bladensburg Cross violates the EC. Maybe he thinks that voters will retaliate and vote Republican in future elections. At the same time it appears that he does not want government favoring Christianity over other religions. This could explain why he argued as follows: “What about saying past is past ... but no more?” On the one hand “we’re not going to have people trying to tear down historical monuments,” but on the hand “we are a different country now” that is more pluralistic. The 2015 National Defense Authorization Act established the World War I Centennial Commission, which was given the authority to build a memorial in Pershing Park in Washington, D.C., so it’s not as if absent this particular memorial there would be no WWI memorial in this area. Nor would the expense of maintaining this old memorial likely be much different from the expense of replacing it given it’s decrepit condition. Justice Sotomayer, to her credit, pointed out that there are few government sponsored large crosses across the nation. “We don’t have a long tradition of that. It’s sectarian.” she said. But the current Supreme Court majority was nominated by Republican presidents. And the Republican party has been ambivalent at best, antagonistic at worst, towards non-establishment of religion for as long as anyone alive today has lived. Non-establishment of religion entails refraining from citing Jesus or a God in the laws and government documents. For people who live and breath Jesus, or a God, non-establishment of their religion can easily be misperceived as being threatening or destructive. 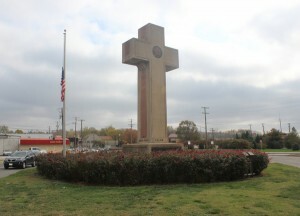 Existing precedent favors a ruling against the Bladensburg Cross. Although the Supreme Court has allowed unequivocally sectarian Ten Commandment displays, with some assistance from Justice Breyer’s search for excuses to allow sectarian displays while denying that the concessions further weaken the already diminished EC, it has been less accommodating of crosses. This distinction between the Ten Commandments and crosses makes little sense, they are both sectarian. Allowing government sponsored Ten Commandment displays is a mistake. Mistake by mistake, the unpopular EC is being eroded by the Supreme Court. At the same time it is necessary to consider the overall context of the displays as Justice Breyer advocates. So, for example, the frieze on the Supreme Court building that depicts multiple “historical” figures from different times, places, and religions, is about the history of the development of laws and therefore the depictions of Hammurabi, Moses, Muhammad, etc. is not an establishment of religion. There is no Babylonian or Jewish or Islamic religious iconography or any depictions of past law makers from different times and places accompanying the Bladensburg Cross. There was no proper reason for the Supreme Court to take this case. Maybe we will get a positive ruling in this case. I hope so. The introduction of the EC was one of the big advances in human government. China has an establishment of atheism which is consistent with its authoritarianism. Non-establishment of religion is a democratic limitation on government power. It is tragic to witness the EC being attacked and weakened in its country of origin. This is a symptom of the reality that the future of democratic government has not been secured. Yet there has been some recent progress in reducing establishments of religion in some European countries. It is encouraging to witness people pursuing this lawsuit and advocating for the EC. Our world can be a better place and the EC has a role in making it so. The American Humanist Association argued a case in front of the Supreme Court on Feb. 26 about the Bladensburg Cross. A demonstration was held in front of the Supreme Court building. Watch the video of the speakers here, and WASH president Samantha McGuire speaks at 24:00. The case was based on the idea that the war memorial that is a cross doesn't represent non-Christian soldiers. The cross is large and imposing, it is located on land owned by the State of Maryland, and it doesn't have any obvious or easily seen reference to a war, but rather it just looks like a big cross. I'd like to add another argument that is actually a defense of Christians. The cross is a symbol of the Christian religion, recognized by both Christians and non-Christians. The argument that a cross can be a secular or historical monument, rather than a symbol of a religion, is a ridiculous, absurd statement. I don't understand why Christians will sit by silently and allow this argument to be made into legal precedents. It is an outrageous insult to Christianity to claim that their symbol is nothing more than a secular marker. Naturally, non-Christians like Jews, Muslims, and Humanists have more to object to in this memorial than Christians do. It simply doesn't represent non-Christian veterans as a war memorial. Memorials to veterans who sacrificed to fight a war for the country are close to the most honored public art, as a tribute to their patriotism and personal sacrifice for the good of the country. But the United States is based on the idea of cooperation between people of all national backgrounds and faiths, and memorials shouldn't be based on a symbol of only one religion. "There is a brief here that says that, to deeply religious Christians, secularizing the cross is blasphemy. Christ died on the cross. He was resurrected from his grave. So those people don't view secularizing the cross as something -- it's not just Jewish people or Hindu people who might be offended. It could be Christians as well." The Christian cross is simply not a secular symbol that can be separated from its religious significance. Any politician or Supreme Court justice who argues that it is should be ashamed of themselves. If atheists must be the ones to stand up and make this defense of the Christian cross for the benefit of Christians, then bring it on!